Certification program of products and process, that aims at specify the safety and quality, as well as operational criteria. BRC Certification ensures that the peanut produced by CAP meets the strictest quality standards and fully meets the customers of the most demanding markets. Kosher is the definition given to the food that is prepared according to the Jewish laws of food (named Kashrut), and found in the Holy Bible or Torah. The kosher food is not only purchased by Jewish, but also by Muslims, Adventists, vegetarians, people with allergy of some kind of food and ingredient and other consumers that just consider the kosher food as high quality. 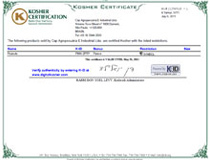 Due to the high quality of its products and process, the CAP Agroindustrial’s products have a Kosher Certification, therefore they meet the requirements of the Jewish community.